Three months ago Darren Ferguson asked his Doncaster Rovers team to put their foot down in the race for promotion. And last night the League Two leaders hit something close to top gear to inflict a first away defeat on fourth-placed Portsmouth since late September and move ten points clear of them in the process. Since Ferguson asked his team to take it up a notch, before the victory over Barnet, they have won ten out of 14 league games, moving through the gears in the process. And after a productive festive period that saw Doncaster predominantly dig out results, they rounded off the busy period with an accomplished performance, particularly in the second half, against a dangerous Pompey outfit. The highlight of the evening was a fantastic second goal, a brilliant team move finished in style by Tommy Rowe which started deep in their own territory. But equally pleasing was the calmness and also doggedness that Ferguson’s men displayed against one of the division’s best sides, particularly after they had levelled things up through Kal Naismith. The only sour note for Rovers was seeing impressive goalkeeper Marko Marosi stretchered off in the closing stages, although Ross Etheridge coped very well following his recall from Alfreton. Craig Alcock returned to the starting line-up at the expense of Harry Middleton as Rovers reverted to 4-4-2 with Rowe at the tip of the midfield diamond and James Coppinger alongside John Marquis. 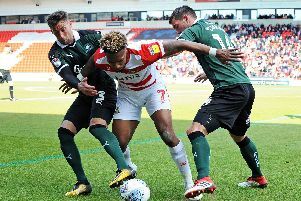 The Doncaster squad had gone to great to lengths to ensure they remained fresh for their third game in six days and they certainly started the game with a spring in their step - and broke the deadlock with their first attempt on goal after five minutes. Coppinger’s cross from the right was flicked on by Matty Blair and Marquis planted his header low into the bottom corner. As the visitors struggled to settle Conor Grant tested David Forde’s handling with a well-struck effort, while the roaming Rowe caused problems in-between the lines. It took quarter of an hour for Pompey to threaten, when former Rovers loanee Enda Stevens got in down the left channel and flashed a deflected cross into the side-netting. It proved to be the cue for Paul Cook’s men to wrestle back the initiative and from the resultant corner Marosi had to make a superb save low down to keep out Matt Clarke’s header. Pompey were now enjoying greater possession and territory but it was Doncaster who came closest to doubling their lead when Marquis headed Alcock’s cross onto the angle of the post and bar. It was no great surprise when the equaliser arrived on 41 minutes but the nature of it was a shock. Jordan Houghton, usually so conscientious in possession, gifted the ball to Kyle Bennett in the centre circle, allowing the former Rovers man space and time to play in Naismith who coolly slotted past Marosi. The second period began with both sides enjoying decent little spells of possession but neither goalkeeper being overly-worked, until Marosi had to get down to stop a deflected drive from marauding left back Gareth Evans. Rovers re-took the lead just before the hour mark and it was a contender for their best goal of the season as Rowe finished off a brilliant team move from back to front. A slick move down the right ended with Coppinger feeding Rowe who beat his man and slammed a brilliant left-footed effort past Forde. Andy Williams came off the bench to offer a lively presence up front and Middleton added fresh legs in midfield. There was now a calm authority about Rovers and that sense only increased when, on 71 minutes, Rowe crossed from the left for Marquis to volley in the third. Just before departing, Marosi made another smart save from substitute Milan Lalkovic’s header and Conor Chaplin also lifted a shot over the bar from close range. Rovers: Marosi (Etheridge 86), Alcock, Baudry, Butler, Mason, Houghton, Blair (Williams 55), Grant, Rowe, Coppinger (Middleton 67), Marquis. Subs not used: Wright, Keegan, Beestin, May. Portsmouth: Forde, Evans, Burgess, Clarke, Stevens, Doyle, Rose, Baker (Lalkovic 62), Naismith (Chaplin 75), Bennett (Roberts 67), Smith. Subs not used: O’Brien, Whatmough, Linganzi, Hunt.